Rhytmus is an old school rhythm machine. 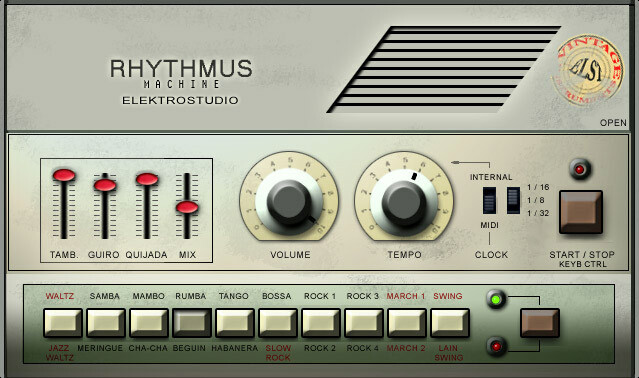 Rhythmus is inspired by an old rhythm machine. There are ten buttons available, each button can play two different rhythm sections so essentially there are about 20 different rhythmic loops offered, such as samba, mambo, tango, waltz, rumba etc. When you clickopen, you can change the tune, volume, pan of each rhythm component such as snare, bongo, cowbell, hi-hat, etc. You can mix these rhythmic sections with Tambourine, Guiro, Quijada sounds. 20 loops (samba, tango, waltz etc…).